Happy Holidays my dear readers! I hope this season fills you with love and warmth and your kitchen feels like the happiest place in your home. This year has flown by me. I know that’s trite and ridiculous, and I’m showing my age but seriously. That’s how it has felt. It feels like it *should* be March and asparagus should be just peaking in season. Of course it’s December and the end of 2009. Thank God. I mean that in both the sarcastic sense and the literal sense. I guess it’s a coming of age thing when you recognize both the monumental joy a decade has brought you right along with a recognition of the pain felt along the way. Do *any* decades just feel amazing start to finish with love and peace and prosperity the overwhelming theme? If so, I’d like one of those please. 1. My sweet husband. 7.5 years of marriage this Christmas and 13.5 together. Thanks for being on my team, even when I want to throw things at your head, and thank you for always being you, the love of my life. 2. My children. What a journey it was to have you here with me. The road was full of heartache, but the end is my ultimate bliss. You are everything I ever wanted. Literally. And I love that both of you want to be chefs. 4. My friends and family. Whose support and interest in my blog has totally blown my mind. Thanks y’all. Truly. 5. The abundance of groceries in my life. Both the actual food and the multitude of options I have for procuring them. I am a seriously blessed lady. So if you made it through my holiday musings, this is the soup I created for a pre-Christmas dinner at my house. I love a soup course, and hate to serve a meal without one. 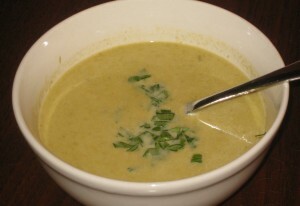 We had Cream of Asparagus soup at my luncheon on my Wedding Day, and it has always held a sweet place in my heart. You hear cream of …, and I see some of you tuning out. Let me be clear – this is a predominantly asparagus and broth soup, cream is present, but it is not a cream based soup. It was very well received. I originally topped these with the tips of the asparagus, but they tended to sink. So unless you want to top your soup with a dollop of cream, they may not be the best food presentation choice. Reserve 20 of the prettiest asparagus tips for garnish. In a heavy bottomed stock pot, melt your butter on medium heat. Add chopped onions and saute for 5 minutes, stirring to ensure you are not browning the onions. 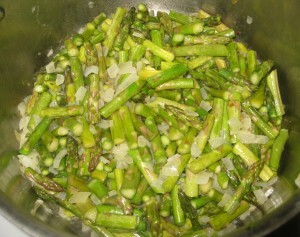 Add asparagus and satue an additional 5 minutes. Add chicken stock, bring to a boil, then reduce heat and simmer for 20 minutes or until asparagus can easily be chopped in half with the edge of a wooden spatula. Splitting into 3 batches, puree soup in a blender. Once all pureed, in stock pot, add puree with cream, madeira, and lemon juice. Add salt and pepper. Think of your seasonings as a jumping off point to start negotiations, bring soup back up to heat on medium, not to a boil, but warm. Meanwhile, place asparagus tips in a pan of boiling salted water. Cook until tender about 8 minutes. Let soup rest 5-10 minutes at just below medium heat, then recheck and adjust seasonings as warranted.